Deveneys of Dundrum: Pinkus and Brunehaut in November. Pinkus and Brunehaut in November. Last Thursday was our November beer club. 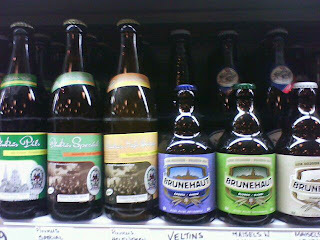 We tasted the new German Pinkus range and the New Belgian Brunehaut trio. The other was the Brunehaut Amber - Amber, surprisingly enough, in colour. The nose is creamy caramel and butterscotch notes. The palate is a combination of vanilla, ripe fruit and some hop on the finish.€3.49 bt. Pinkus muller-hefe, quite an unusual style of German wheat beer. The nose is quite traditional, cloves, banana but the palate is very floral and heavily hopped. Not unlike the Hopfen Weisse by Schneider. slightly acidic finish. Brunehaut Wit has a Belgian wheat beer nose, citrus, slightly candied. The palate is much chalkier than other Belgian whites. Dry and lacking the typical orange peel and lemon characteristics that I love. Brunehaut Blonde was a little disappointing for a Belgian blonde. The nose had some element of spice and yeast but the palate was a little too light, slightly yeasty with an earthy finish... Not unpleasant just a little insignificant. I'm unsure of a theme for next month but something festive that works well with a turkey and ham sandwich in view of Stephen's day. Keep you all posted. Labels: Pinkus and Brunehaut in November.